The sales and marketing methods that have dominated the channel for decades are outdated, archaic and bordering on obsolete, with customers turned off to traditional techniques. A damning assessment of partner capabilities perhaps, but EDGE Research findings highlight a growing disconnect between how partners attract, acquire and engage with end-users. Driven by disconnected yet long-established practices, customer dollars are being diverted away from partner purses through legacy sales tactics and a perpetual cycle of marketing mediocrity. “Customer acquisition and engagement is the new sales and marketing,” said Mark Iles, executive analyst at Tech Research Asia. 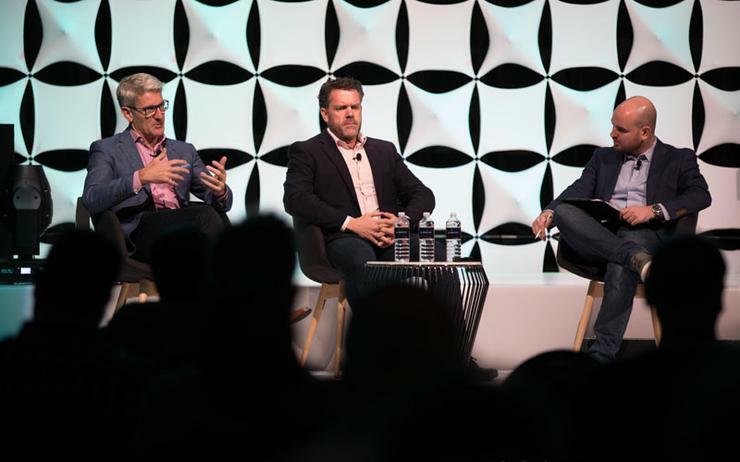 “Partners must rethink how they go to market because so far, they haven’t reinvented themselves. “Most partners have head of sales and head of marketing roles but today, those titles make no sense. They shouldn’t have either because they are very traditional approaches, the focus should instead be around creating customer acquisition and engagement positions. According to Iles, partners must deepen focus on customer acquisition, alluding to EDGE Research findings which emphasise a longer engagement cycle between the channel and the end-user. “When partners acquire a customer, this customer must be seen as a customer for life,” added Iles, referencing earlier findings. “Partners must look at customers through the lens of a telco - think about the cost of acquisition and the life-time value. Therefore, and in acknowledgement of such a shift, Iles advised partners to stop thinking about sales and marketing in conventional manners. 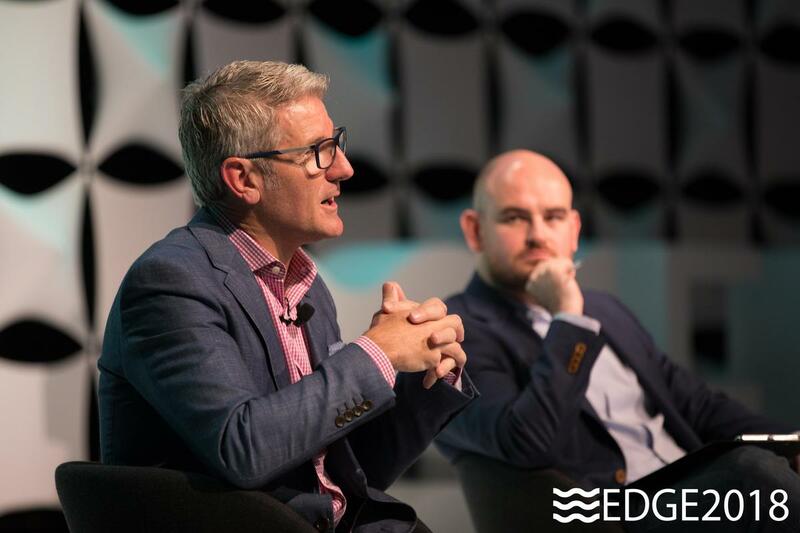 As outlined via EDGE Research, 65 per cent of partners claim to be “ready and selling” on the promise of continued customer experience, with one provider leveraging management tools to gauge end-user loyalty and satisfaction levels. “Last year we implemented NPS [net promoter score] in our organisation to measure client experience for all our projects and managed services,” said one partner during the survey. A further 16 per cent of partners are “ready and discussing” ways to improve customer experience, with 11 per cent expected to follow suit within the next 12 months. “This is a great example of partners thinking about their customers differently,” Iles said. “Every partner should implement some kind of NPS because this will impact whether your customer retention will increase or decrease. “If you’re moving towards customer lifetime value and not just banging deals out, you must also focus on customer engagement. Partners must assess how they communicate with customers on an ongoing basis and communicate much more like a vendor does. In looking back on more than 30 years of market disruption, Iles acknowledged that historically, partners have been strong in servicing customers’ accounts. For many in the channel, such strength is a badge of honour, a key differentiator in an ecosystem bursting at the seams. Because according to Iles, having a strong reputation and a core customer base “doesn’t count for much today”, in a market made up of new buyers with new priorities. “Unless partners are relevant today, that’s no longer important,” Iles warned. “Being relevant forces partners to focus more than they ever have done previously, assessing what they do well, what market they want to aim for and which customer they want to target. “Partners might be looking to add 10 new customers each year and each one of those customers is significant. Then that might be all you need to do each year. 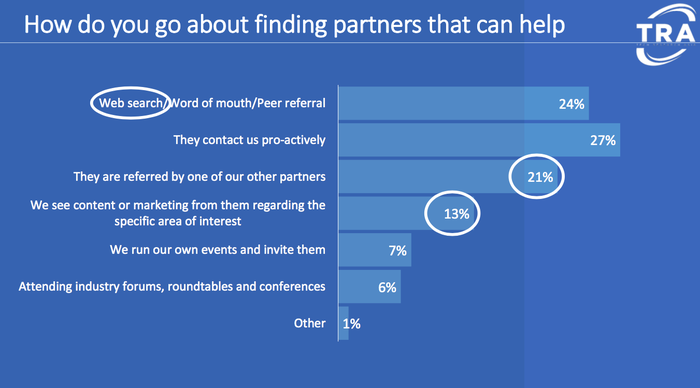 Across the channel, partners prioritise referrals from existing customers when acquiring net new business. Such an approach is also complemented by leads generated through a partner’s own website, search engine optimisation and content marketing, ahead of events such as seminars, workshops and roundtables. Yet as EDGE Research findings show, misalignment exists between a partner’s ability to hunt for new customers, compared to an ongoing reliance on leaders from key vendors. “Partners have to be able to acquire customers themselves, they can’t simply rely on the vendor,” Iles explained. “Some forward-thinking partners are also grading customers today, through an A, B and C ranking system. “That’s a great approach and helps focus on customers that the business actually wants. There might be much more profitable customers in your business that can be replicated, meaning you can remove unprofitable customers in a considered and structured way. Too often, Iles said partners bundle customers together due to the misplaced belief that more customers mean more money for the business. “More of the right customers is always good,” Iles cautioned. “But I get it, nobody turns down a customer and it’s very hard to hard down a deal. On the slip side, 24 per cent of customers find partners through web search, word of mouth or peer referral, while 27 per cent are contacted proactively by the provider. Delving deeper, 21 per cent of customers said partners are referred by one of the organisation’s other partners, while 13 per cent consume content or marketing within a specific area of interest. Meanwhile, a lowly six per cent of customers find partners from attending industry forums, roundtables or conferences. 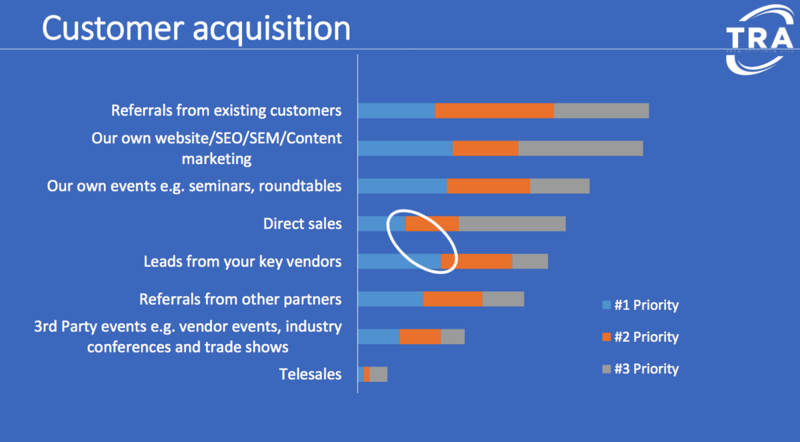 According to EDGE Research findings, the current anatomy of a partner aligns to the traditional make-up of a reseller. 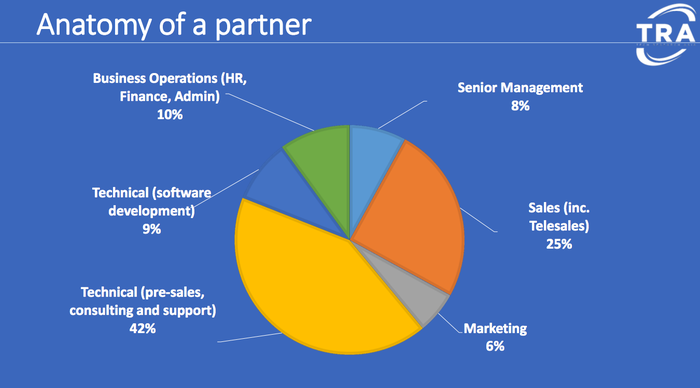 Specifically, 42 per cent of a partner business is made up of technical expertise, spanning pre-sales, consulting and support services, following by 25 per cent within sales, 10 per cent across business operations - such as HR, finance and administration - and nine per cent specialising in software development. Furthermore, eight per cent make up senior management leaving six per cent of the organisation focused on marketing. “Every partner must sit down, spend time offsite and out of the business to assess - what is their real differentiator?” Iles asked. “What’s the magic that they have? 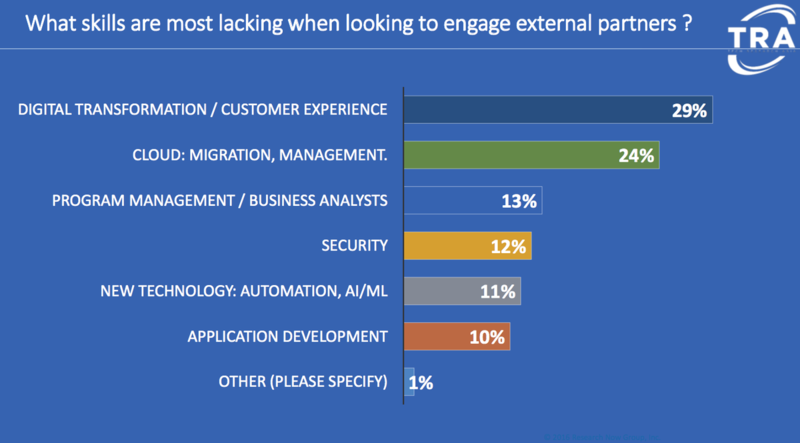 Delving deeper, the skills most lacking for customers when looking to engage with external partners centre around digital transformation and customer experience, impacting 29 per cent of end-users. In addition, 24 per cent of customers seek cloud expertise across migration and management, alongside 13 per cent searching for skills across program management and business analysis capabilities. Rounding off the list, businesses seek security (12 per cent); emerging technologies such as artificial intelligence and machine learning (11 per cent) and application development (10 per cent) as current gaps within an organisation, gaps the channel is well placed to fill. But according to Iles, must partners remain challenged to identify a standpoint segment of market differentiation. “Most partners still don’t know what they’re really good at,” he said. “It’s often better for partners to do that with eternal help but it’s crucial for partners to go through this process. Specifically, Iles asked, what’s the beginning of such a journey? “Work on the language around what you do in the market and the solutions you provide,” Iles added. “Create content and thought-leadership papers and reach your target audience. And then, enable your sales team. “Progress customers through the pipe and then someone can engage with them on a new level. But who is that person in your business? What’s their skill-set? What do they do?